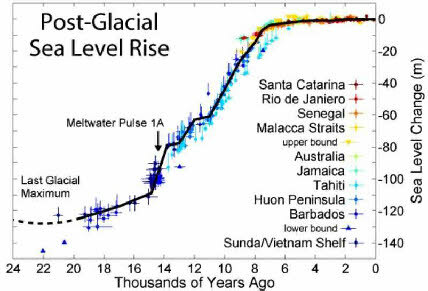 This graph starts at the peak of the last ice age (Glacial Maximum) and shows sea level rise as the glaciers melted. 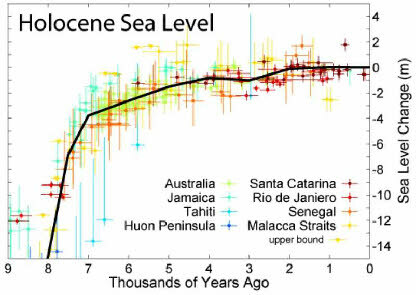 The rapid sea level rise slowed about 8,000 years ago, but continues. Notice that the vertical scale is 10 meters (30 ft.) per division. 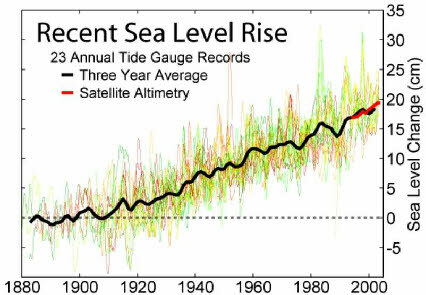 This graph starts at the start of the last ice age and shows that the rate of rise has slowed, but continues. Notice that the vertical scale is 1 meter (3 ft.) per division. 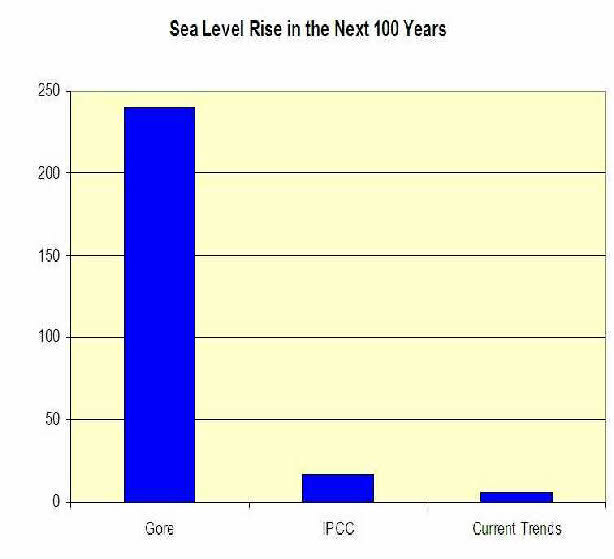 The last 120 years show a constant rate of rise, with no noticeable speed up after the 1950s when CO2 levels increased. Notice that the vertical scale is 0.05 meter (2 inch.) per division. The rate of rise was 20 cm (8 in.) in the 100 years from 1910. 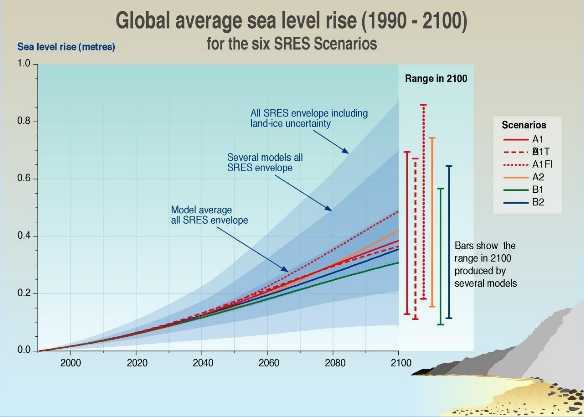 This IPCC chart shows a range of projections from various models along with “uncertainty” envelope. The range of the upper projection is from about 0.1m (4”) to 0.9m (36”) inches. This is a doubling of the recent historic rate of rise. Or an extra 9 inches on top of the historical 8 inches. Notice that the IPCC prediction is about double the recent rate of rise and that Al Gore’s prediction is many times that of the IPCC. 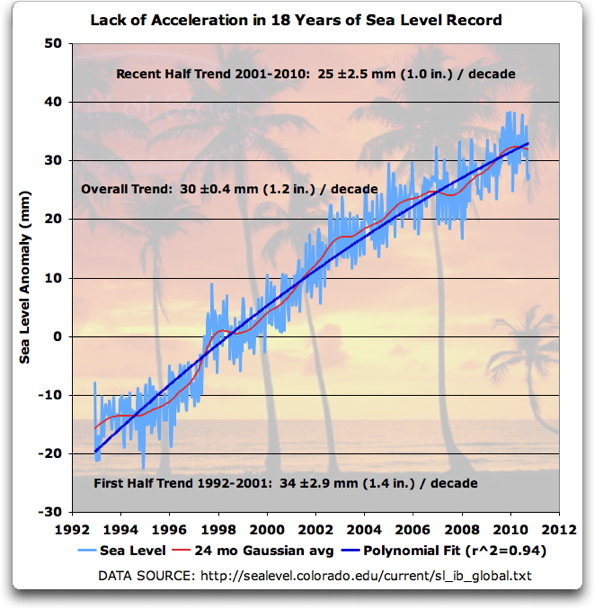 See: Trends and acceleration in global and regional sea levels since 1807. Global and Planetary Change 113: 11-22. Jevrejeva, S., Moore, J.C., Grinsted, A., Matthews, A.P. and Spada, G. 2014.